A novel way of making 3D nanostructures from DNA is described in a study published in the renowned journal Nature. The study was led by researchers at Karolinska Institutet who collaborated with a group at Finland's Aalto University. The new technique makes it possible to synthesize 3D DNA origami structures that are also able to tolerate the low salt concentrations inside the body, which opens the way for completely new biological applications of DNA nanotechnology. The design process is also highly automated, which enables the creation of synthetic DNA nanostructures of remarkable complexity. The team behind the study likens the new approach to a 3D printer for nanoscale structures. The user draws the desired structure, in the form of a polygon object, in 3D software normally used for computer-aided design or animation. Graph-theoretic algorithms and optimization techniques are then used to calculate the DNA sequences needed to produce the structure. When the synthesized DNA sequences are combined in a salt solution, they assemble themselves into the correct structure. One of the big advantages of building nanostructures out of DNA is that the bases bind to each other through base-paring in a predictable fashion. 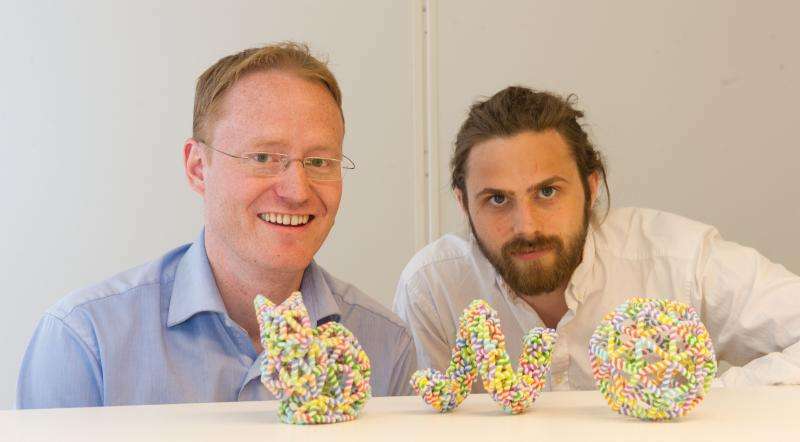 "This new method makes it very easy to design DNA nanostructures and gives more design freedom," says study leader Björn Högberg from the Department of Medical Biochemistry and Biophysics at Karolinska Institutet. "We can now make structures that were impossible to design previously and we can do it in the same way as one might draw a 3D structure for printing out in macroscopic scale, but instead of making it out of plastic, we print it in DNA at the nanoscale." Using this technique, the team has built a ball, spiral, rod and bottle-shaped structure, and a DNA printout of the so-called Stanford Bunny, which is a common test model for 3D modelling. Apart from being simpler compared to former ways of making DNA origami, the method – importantly – does not require high concentrations of magnesium salt. "For biological applications, the most crucial difference is that we can now create structures that can be folded in, and remain viable in, physiological salt concentrations that are more suitable for biological applications of DNA nanostructures," explains Dr Högberg. "An advantage of the automated design process is that one can now deal systematically with even quite complex structures. Advanced computing methods are likely to be a key enabler in the scaling of DNA nanotechnology from fundamental studies towards groundbreaking applications," says Professor Pekka Orponen, who directed the team at the Aalto University Computer Science Department. The possible applications are many. The team at Karolinska Institutet has previously made a DNA nano-caliper used for studying cell signalling. The new technique makes it possible to conduct similar biological experiments in a way that resembles conditions within cells even more closely. DNA nanostructures have also been used to make targeted capsules able to deliver cancer drugs direct to tumour cells, which can reduce the amount of drugs needed. Does this enable them to create the tiny vascular structures in synthetic organs that were previously too small and complex to create?